There’s a certain type of wisdom that only comes with age and the experience; of seeing many things; by observing quietly and absorbing; by understanding. Sitting in the suburb of Santa Úrsula in Mexico City, the Estadio Azteca is not only an imposing architectural edifice, it can also boast a rich history of hosting some of the most celebrated matches in the history of international football. Being the first venue to host two World Cup Finals, it’s fair to say that the old stadium has witnessed a fair bit of the ‘beautiful game’ with some of the rarest of talents ever to grace the international arena treading its turf. When the Azteca speaks of greatness therefore, it’s done with the authority of age and experience. It’s beholding on us all to listen. Outside of the Azteca stands a monument, complete with plaque. It commemorates what it describes as “Pertido deal Siglo” translated as “The Game of the Century.” This is the stadium where Pele and his bright yellow shirted team-mates dazzled and defeated Italy to win their third World Cup with goals from Jairvinho, Gerson, Carlos Alberto and the Pearl himself. It was a game where ‘Jogo Bonito’ re-established itself as the reigning paradigm of the highest aspirations of the game. The plaque however speaks not of that game, but one played a few days before that Sunday showdown on 21st June 1970. To some such ‘homage’ to what was, after all, a mere prequel to the big event may seem somewhat perverse, especially when the final itself was a thrilling encounter that saw the soul of football reclaimed for the beautiful game. For many others who can recall the events of 17 June 1970 however, it’s not too difficult to understand how a game, that for 90 minutes appeared to be heading for a 1-0 result as the Azzurri ‘catenaccio’ sought to stifle play, jealously guarding a single goal advantage, justified such acclaim. It was the events of the time following the 90th minute however, that justified the soubriquet, ‘Partita del Secolo’ in Italian or, ‘ Jahrhundertspiel’ in German. To say that Italy’s previous four years, ahead of the 1970 tournament had resembled a switchback of fortunes may be putting it mildly. During the 1966 event, they had endured the humiliation of losing to North Korea in Middlesbrough, when Pak Doo-Ik’s goal meant a crestfallen return journey home following elimination was greeted by peltings of rotten fruit form angry tifosi turning the air blue with insults aimed at the Azzurri, and pelters from the press lambasting their fallen heroes. It was therefore little surprise when the unlamented manager Edmondo Fabbri was removed from his post shortly afterwards. The Italian federation had clearly picked up on the old maxim that when all else fails, the best course of action is to sack the manager. It was however to be a prescient move. Replacing the hapless Fabbri, it was decided that a ‘technical commission’ would be put in place. It was a strange decision, but one born of compromise in the absence of a clear consensus. Comprising the commission was the much travelled and highly experienced Helenio Herrera, former manager of Barcelona, Internazionale and Roma, together with Ferrucio Valcareggi, previously in charge at Atalanta and Fiorentina. The task of raising the national team from its knees, appeared the logic, was best served by two pairs of hands, rather than one. It wasn’t long before calmer minds prevailed however, and Valcareggi was put in sole control. A former player with the likes of Fiorentina and Bologna, Valcareggi appeared a sound choice, and when the 1968 European Championships rolled around, to be played in Italy, the new manager delivered the goods. At this time, the Euros were a fairly truncated affair with a two year qualifying schedule, and then two semi-finals and the final being played as the tournament proper. This meant that despite being hosts, Italy still had to qualify to play in their own country’s ‘final four’ mini-extravaganza. Grouped with Switzerland, Romania and Cyprus, the Azzurri skated through their programme, winning five and drawing with the Swiss in Berne, with the emerging talent of Cagliari’s favourite son Luigi Riva scoring six goals in their last three games. The player who the famous Italian journalist Gianni Brera nicknamed ‘Rombo di Tuono’ (Roar of Thunder) was to figure strongly in the Mexico World Cup. The re-born legions under the guidance of Valcareggi were on the march to Rome. It’s often said that in warfare, a battle plan survives only until the first time the enemy is encountered. Any validity in that old soldier’s adage appeared to be borne out as the Azzurri attempted a Roman coronation. If qualification had been relatively straightforward, having home advantage for the final stages appeared to do little to aid the endeavours of Valcareggi’s charges. The other three finalists were the Soviet Union, Yugoslavia, and reigning World Champions, England. Italy were drawn to play against the Soviets, and after a fairly sterile 0-0 draw, this being before the advent of the penalty shoot-out, the winner was decided on the flip of a coin. This being in Italy, it was little surprise that the coin favoured blue rather than red. Nevertheless, Italy were through to the final where they would face the Yugoslavs, who defeated England 1-0. Quaintly, the third-place play-off and the final were to be played consecutively on 8th June 1968 in Rome’s Stadio Olimpico, with the final scheduled to begin three hours after the preliminary. At least the move would have guaranteed a measurable crowd for the fairly meaningless bronze medal showdown. In the final itself, the Yugoslavs appeared to have successfully landed a surgical strike when Džajić put them ahead just on the half hour. This had not been part of the Valcareggi strategy. Things weren’t going as expected. It could have been even worse had referee, Gottfried Dienst, the Swiss who had officiated the final in 1966 and awarded Geoff Hurst’s controversial ‘was it, wasn’t it’ goal, decided not to award what seemed a blatant penalty when Ferrini charged Musemic in the back. Perhaps it was just the fates of war, but afterwards tales of involvement between Dienst and a renown ‘fixer’ suggested some nefarious espionage behind the white lines may have had a hand. Nothing was given however, and when Domenghini equalised in the 80th minute, a draw was inevitable. Fortunately, someone had foreseen the potential uproar if the continent’s premier international tournament was decided on the vagaries of a coin toss, or in fact two, and a reply took place. This time the Italians overwhelmed what seemed like a fairly exhausted Yugoslav team and won fairly comfortably with goals from Riva – now becoming a potent weapon – after a dozen minutes and Anastasi on the half hour. It was hardly the glorious journey to the trophy that the Italians would have wanted, but Valcareggi’s first run at a tournament had ended with success, and the Azzurri would travel to Mexico as European Champions. It had been a while since the Italians had shone at a Word Cup Finals, but after the humiliation of 1966 and North Korea, the nation’s football team was clearly on an upswing. Valcareggi’s team had a hardened core to it. Their Catenaccio defence, marshalled by the indomitable Giacinto Facchetti conceded little. In midfield, the combative but artful Mazzola vied for control with AC Milan’s 1969 Ballon d’Or winner Gianni Rivera, and upfront Luigi Riva – who remains Italy’s top goal scorer with 35 from 42 games – was a constant threat. They headed to South America with dreams of coming, seeing and conquering. West Germany had suffered in a different way in 1966. Getting to the final was of course a success and after Wolfgang Weber’s late equaliser to take the game into extra-time, they may well have felt that momentum was with them, only to be thwarted by Geoff Hurst, the crossbar and an Azari linesman named Tofiq Bahramov. Not forgetting of course Herr Dienst. Their Euro qualifiers had been been a Curate’s Egg sort of affair. In a three team group with Yugoslavia and Albania, they would have been strong favourites to qualify ahead of their last game just before Christmas 1967. The Yugoslavs had completed their schedule the month before, and sat on six points, after three victories and a single loss to the Germans in Hamburg. The final game saw Helmut Schoen’s team travel to Tirana knowing that the expected victory over the group’s makeweights, who had yet to register a goal in the group and had conceded an average of four per game to date, would see them match the Yugoslavs with a superior goal difference. The Germans however failed to score and the game ended 0-0 with Yugoslavia passing grateful thanks to the Albanians for a bit of unexpected Balkan solidarity. Nevertheless, much as the Italians had their ‘roar of Thunder’ West Germany had ‘Der Bomber’. Gerd Muller, Bayern Munich’s diminutive goal poacher had also scored six times across the qualifying tournament and like Riva would be his nation’s top marksman for a long time with 62 goals in just 68 internationals. He was recently overtaken by Miroslav Klose who now has 71, although it took him more than twice as many games as Muller to get there. As well as Muller, the West Germans were also bolstered by the emergence of Sepp Maier who had took possession of the gloves from Hans Tilkowski in 1967 and would be the guardian of the Mannschaft’s goal for many years to come. Ahead of him was the burgeoning talent of Franz Beckenbauer. The young Bayern player had emerged in the 1966 tournament but by the time the 1970 tournament was in play, so was the full flowering of ‘Der Kaiser’. The West Germans also had the best qualifying record of all the European countries that journeyed out to Mexico, their haul of 11 points from six games, albeit in a group containing neighbouring Austria, Scotland and Cyprus, outstripping any other. At this time, only one nation had won the trophy outside its own hemisphere, when a young Pele inspired Brazil to victory in Sweden, a dozen years earlier. But with England as defending champions, Germany losing finalists, and Italy boosted by their Euro triumph, it seemed that there could be a strong European challenge. Two of those three were destined to fulfil that promise, although their routes to the ‘Pertido deal Siglo’ would be very different. Assured of qualification, Valcareggi took his squad to Mexico in 1969 to assess the conditions with a couple of friendlies against Mexico staged in the Azteca. As a skirmish before the main battle was joined, it served a useful testing purpose. A 3-2 victory and a 1-1 draw were useful exercises, as were more goals for Riva, but the required acclimatisation in the breathless altitude and searing heat of a Mexican summer also had significant influence on the manager’s thinking of how best to plan out tactics for when his team would return for the real thing twelve months later. One of the strategies Valcareggi developed was the ‘staffetta’ – or ‘relay’ in English. There had been a type of ‘Gerrard/Lampard’ conundrum for a while around who should be the advanced playmaker for the Azzurri. Should it be Sandro Mazzola, Internazionale’s classic Italian midfielder who would play more than 400 times across a 13 year career for the Milan club, or Gianni Rivera, Italy’s ‘Golden Boy’ and Ballon d’Or winner who trumped Mazzola’s appearance record by a hundred or so playing for the Rossoneri of Milan. Neither the Giuseppe Meazza Stadio, nor the Lombardian city was big enough for them both to have prominence, little wonder then that Valcareggi decided that neither could the Azzurri. Going into the opening phase of the competition, naturally conservative by nature, Mazzola was his first choice. In Italy’s opening game of the tournament, they faced Sweden. Mazzola started the game, and in a fairly uneventful outing, also finished it, with Rivera sitting on the bench, his raising temperature surely not only caused by the sweltering heat. A Dominghini goal put the Azzurri ahead before the Catenaccio bolt was applied and the game ended 1-0. Next up was Uruguay. The South American Champions had comfortably defeated the group’s supposedly weakest team, Israel, 2-0 in their first game. Again, Mazzola started and finished the game. With both of the group’s ‘big guns’ having won their first game, a draw probably suited both teams – especially Italy with a seemingly easy game to come against the Israelis, and it petered out into a tame 0-0. Rivera still sat on the bench. Uruguay then lost 1-0 to a Sweden team that, having already lost to Italy, could only manage a draw with Israel, with a last minute goal from substitute Grahn. This all meant that Italy only needed a draw against Israel to qualify. In a game where Rivera was finally given his head around the break, replacing Domenghini the Italians opted to form up the ‘Testudo’ and edged unapologetically over the line, securing a 0-0 draw and heading the group despite having scored only a single goal across three matches. Valcareggi had sought to combat the heat and altitude by minimising exertions and hiding behind a Catenaccio scudo, protecting any advantage. Qualification by any other means, however, smelt just as sweet. It was success of a kind, but these sorts of displays were not going to progress matters in the latter stages and where were Riva’s goals? In fact where were any goals? After a tepid group stage, the manager felt he had hit on a solution that allowed him to take the qualities of Mazzola and Rivera into the team, and also combat the environmental conditions of the Mexican summer. It was time for the ‘Staffeta’. The ruse meant that Mazzola would start the game, but be substituted for Rivera at half-time. By this, he could give both of his playmakers full reign for 45 minutes without tiring out either. Mazzola being the harder working defensively, would be more inclined to track back, and after the break, when teams tired, there would be less need for such discipline and Rivera would take over. A bit like with perpetual motion theories however, it’s one of those things that looks like a wizard wheeze on paper, but appears less so, out there, on the grass. If anyone disliked the plan more than the media, it was the pair of players themselves. Both felt slighted by the inference. As with most Italian managers before or since, Valcareggi was going to be a hero if it worked, but the ‘vaffans’ would have been sticking to him like darts, if it didn’t. The press wouldn’t be coming to praise their own particular Caeser, they would be ut to bury him. Valcareggi clearly felt however that if more goals were going to be needed, he had to do something about it. The plan would be tested against the tournament hosts in the quarter-final. In Group 1, Mexico and the Soviet Union had finished level on points and goal difference. Unable to be separated by results, it was decided that lots would be drawn to see who would face Uruguay as group winners, and who would face the Azzurri. The Soviet Union prevailed and faced Uruguay in the Estadio Azteca, and Mexico would play Italy in Toluca. Despite Mexican protests that moving the host nation to the smaller Estadio Luis Dosai stadium would cause traffic chaos, the decision stood. In a game that seemed to prove the Mexican appeals had merit, 26,851 watched the hosts take on Italy, whilst in the giant Estadio Azteca just under a thousand less turned up to watch the Soviet Union lose out to Uruguay after extra time, González put Mexico ahead after 13 minutes. The ball was played to him as he advanced into the Italian penalty area, and from about ten yards, he beat Albertosi with a low shot from the outside of his right foot. Emboldened by the goal, the Mexicans continued to attack and Albertosi was forced to scramble a low shot around his left post. But the Italians were to fire back. Leading the line with strength and power Riva ‘thundered’ into the Mexican box, refusing to be muscled off the ball despite repeated challenges before snaffling a pass out to Domenghini who drilled the ball into the area. Attempting to cut out the Italian’s low cross, Guzmán slid into the path of the ball, but only manged to divert it past his own goalkeeper at the near post. The Italians were level, but had still only scored a single goal of their own making. All that was to change though. Having scored – albeit fortuitously – confidence came rushing back into the Italy players. The ‘Testudo’ was cast aside and an advance launched. Mazzola fired an attempt in from range that was comfortably smothered, before Facchetti, venturing forward hit a shot that caused a scramble in the box before being cleared. In the second half, Rivera replaced Mazzola and immediately started to provide the sort of ammunition Riva needed to fire the Italians forwards. A cross from left was headed on to goal by the Cagliari striker but safely collected. The game was much more open now, and Mexican counterattacks looked just as dangerous as the Italians’ own sallies forward. Whilst the green-shirted Mexicans struggled to seriously threaten Albertosi however, the Italians had the stiletto of Riva. Just past the hour mark, Rivera found the Cagliari hitman lurking on the edge of the Mexican box. Running diagonally, Riva opened the angle before firing back across the goal to score just inside the far post. It was a precision strike. Now Riva was scoring. The Mexicans fought back, and from a corner, Domenghini headed off the line, then Albertosi sprung to his left to tip a fierce drive away. Rivera had sparked the Italian front line into life and with less than twenty minutes to go, he helped himself to a goal. Striding onto a break, he rounded Calderon before squaring. After a brief scramble, the AC Milan midfielder regained possession and fired home to put Italy clear. The Italians threw themselves onto a pile of celebrations, whilst the Mexicans slumped to the floor nearby, knowing their fate was probably sealed. There was time for one more goal. Breaking quickly against a tiring defence, the ball reached Riva who rounded the goalkeeper before placing it neatly between a covering defender’s legs and into the net from the far post. Valcareggi had guided Italy to the last four, but who would they meet in the quarter-final. West Germany had been placed in a group with Peru, Bulgaria and Morocco. Along with Maier, Beckenbauer and Muller, the Germans also had the estimable Uwe Seeler captaining the team, and now in his final World Cup. The wise old head of the skipper and the rapier sharpness of Muller promised the goals that the Italians had failed to produce in the group stage. They weren’t to disappoint. Opening up their campaign against the North Africans, West Germany fell behind to a goal from Jarir, but replies from Seeler just after the break, and Muller with ten minutes remaining saw them home to victory. In the second game they faced Bulgaria and again fell behind when Nikodimov scored after 12 minutes. A goal from Libuda shortly afterwards restored parity before Muller netted to give West Germany the lead. After the break, Der Bomber added a penalty, before Seeler added a fourth and Muller scored again with a couple of minutes to go, claiming a hat-trick and the Germans’ fifth. A late goal from Kolev was hardly any compensation at all for the East Europeans. In the final game, Peru were the opposition. No chances were taken about going behind to the South Americans and Muller scored his second hat-trick in as many games, before Cubillas pulled one back. Although both Italy and West Germany had qualified from their respective groups with some room to spare, their roads had been very different. Whilst the Azzurri defence had resembled Scrooge in a bad mood, and the attack netted a single goal, West Germany had plundered ten goals in three games, with their star striker Muller scoring seven. As group winners, Germany would face off against the runners-up in the group containing England and Brazil. Either the World Champions, or the tournament favourites. Neither was an enticing prospect, but in the deciding game, when Jeff Astle mishit a chance to equalise, the fates ware cast and a quarter-final against England was in prospect. It was a replay of the previous tournament’s final – and a chance for revenge. The way the game started however, that eventuality seemed a long way off. England began the game in Leon in confident mood. The 1-0 loss to Brazil was the deciding game in the group, in the other games comfortable, if unspectacular, victories over Czecheslovaskia and Romania had confirmed the opinion in many people’s minds that the reigning champions could make a decent run at defending their title. It had helped England’s cause that Helmut Schoen had chosen to sacrifice the attacking potential of Franz Beckenbauer, by detailing the midfielder to negate the influence of Bobby Charlton. The one dark cloud on the holders’ horizon was that Gordon Banks was missing. Beaten only once by Brazil‘s stars and after producing a miracle save to push a Pele header up and over the bar when any mortal would surely have been fishing the ball out of the net, the England stopper had been taken ill with food poisoning. In his stead stood Chelsea’s Peter Bonetti. No-one would argue that Bonetti was at Banks’ level, but very few goalkeepers were. The Chelsea player had produced two outstanding performances however to help the Blues lift the FA Cup a few weeks earlier though, so would have been feeling confident. Losing Banks was inevitably a weakening of the team, but at the time, it didn’t feel fatal. The loss certainly didn’t curtail England’s attacking potential, and on the half hour, right back Keith Newton advanced to the left-hand edge of the West Germany penalty area and was faced by Overath. Instead of trying to skip past the German and cross however, Newton looked up and saw Alan Mullery making a run across Maier. He clipped the ball forward and Mullery deftly flicked the ball past the ‘keeper and into the net. England were ahead. The lead was held until the break and England went into the dressing-rooms 1-0 up. Although the Germans emerged for the second period to be more energised, it was England who would score next. Again, Newton advanced down the right, but this time headed towards the dead ball line before crossing to the far post. Advancing was Martin Peters, who met the cross and swept the ball into the net to double England’s advantage. It was a scuffed shot that Maier should surely have done better with, but England cared not one jot. Although the Germans pressed, England’s defence appeared resolute and their midfield kept a fair firm hold on the game. As the game progressed however, the searing heat took its toll and players began to suffer. Legs grew heavier, as chasing back became more and more difficult. Suffering more than most was Bobby Charlton, and prospering from it was a much younger Franz Beckenbauer. Spaces began to open up. Nevertheless, as the final twenty minutes approached England remained two goals clear. Then, as both German anxieties and English confidence grew in tandem, the wheel turned. Enjoying increasing freedom, Beckenbauer picked up the ball in the England half, and advanced, swaying past Mullery before firing right-footed from the edge of the area, across Bonetti and into the far corner of the net. Should the Chelsea ‘keeper have done better? Many have said so, but the only thing that mattered now was that it would take a backs-to-the-wall effort from the tiring England players to see the lead through to full time. Ramsey replaced Charlton. Too late for those who thought fresher legs would have restrained Beckenbauer. Too early for those who thought the change took the reins from Der Kaiser. Managers of course are only right when they win and Ramsey has been castigated for many years over the timing of the decision. The lead still held though as the last ten minutes were entered. West Germany pressed but as England sank further back, a goal always seemed on the cards. With just eight minutes remaining, a cross into the box by Schnellinger was acrobatically headed backwards by Seeler, and the ball looped over Bonetti and into the net. The German resilience was now in full cry and although England held out until the whistle to end the ninety minutes, extra time was to be played, and the result always seemed to be falling towards the Germans. Just three minutes after the break in extra time, Gerd Muller volleyed past Bonetti to complete the German comeback. England raised a couple of token efforts to square things up, but by now, fatigue had eaten away at their aching limbs and the Germans coasted across the line to book their place in the semi-final, and a date with the Azzurri. Despite the strength-sapping exertions against England, there was clearly no lack of confidence amongst Schoen’s team. Uwe Seeler hit the tone: “Once you have beaten England, you know you can beat anyone.” For the Italians, flushed with the apparent success of the ‘Staffetta’ a reprise seemed the obvious call and Mazzola started the game, with Rivera poised to take over after the break. Both teams had cause to believe they would win out. No-one, especially after the initial 90 minutes, however, would have expected the oh-so dramatic denouement. This was a more naïve time, when television’s money had yet to take possession of the game’s soul, as it chased to prostitute every last crumb of decency for bigger and bigger bags of swag, and both semi-finals were played simultaneously. Whilst Brazil were to play, and comfortably beat, Uruguay in the all South American game in Guadalajara, the European stand-off would be played out in the Azteca. Reigning European Champions against the previous tournament’s losing finalists, suggested a pedigree of mouth-watering proportions, but the game proved to be the very epitome of a slow burner. A mere eight minutes had passed when the deadlock was broken however. Inter Milan striker Roberto Boninsegna had yet to register a goal for the national team, but if you can choose an occasion for a debut goal, a World Cup semi-final is not a bad slot. Running forwards with the ball he seemed to attempt an intricate wall pass move with Riva, threading the ball through a trio of white-shirted defenders. Riva flicked the ball, intending to return it, matching up with Boninsegna’s run. The ball struck a defender however, and bounced back towards the Italian, falling between him and Beckenbauer. The Nerazzurri striker won a brief tussle for the ball, and then fired left-footed past hit Maier to give Italy the lead. If, for many, the first goal was seen as a lighting of the blue touch paper that would ignite the fireworks, they were proved to be wide of the mark. It wasn’t quite a damp squib, but as the Italians crouched behind their scudo, and applied the ‘bolt’ it looked like a long and broadly frustrating prospect was at hand for West Germany. It would be easy to say that this was a purely negative tactic, but by this time, Italy, under the wily prompting some of Valcareggi, were a case-hardened streetfighter of a team. West Germany would be committed to attacking and the longer the blue shield held firm in front of Albertossi, the more urgent their sallies would become. When England took a two goal lead in the quarter-final against the same opposition, they had merely continued to play and the greater German resilience eventually wore them down. Had they retreated to the redoute and sought to frustrate and play out time, a better outcome may have been achieved. Perhaps more streetwise, the Italians chose a different strategy. Defend in numbers, draw the Germans on and seek to deliver a lightening counter strike with their Roll of Thunder. If they weren’t to score again, Italy had 82 minutes to hold out. 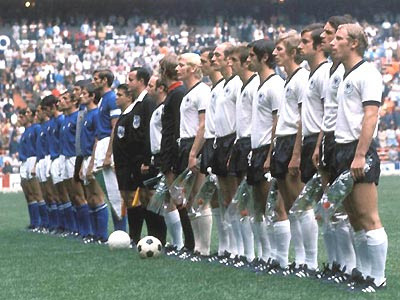 If it appeared an age to the blue-shirted players, it would have felt like an all-too-brief moment for the Germans. Comforted by their haul of goals from the earlier games however, the Germans ploughed forwards with gusto. A corner from the left saw Seeler leap and head towards Albertossi’s top left corner. The grey-shirted ‘keeper however flung himself acrobatically to palm the ball away. It was to set the pattern for much of the remainder of the nitty minutes. Having fought back from deficits in previous games and with still the overwhelming part of the game to play, the Germans would have not been too concerned, especially having the razor-sharp cutting edge of Muller upfront who would end the tournament as top scorer with ten goals. As time ticked away however, faith began to drain away with it. The acrobatic Albertossi seemed in inspirational form, hurling himself across the goal to prevent shots and headers, and even when he was beaten, the woodwork came to Italy’s assistance. Two reasonable shouts for penalties were also turned down by the Mexican referee. Wave after wave of German attacks resulted in nothing, with always the danger of a counterattack from the Italians killing off the game. The time was draining away like sand through the fingers of German hopes, as the clock ticked around towards ninety minutes and still Albertossi hadn’t been beaten. Still the blue scudo stood solid. With just three minutes remaining, Franz Beckenbauer strode towards the Italian area before being tumbled. Penalty? Clearly so if you were wearing white. Much less so if your jersey was blue. The referee appeared to be unsure then resolutely decided. He waved away the German protests and awarded the free kick on the edge of the area. The damage to the Germans wasn’t restricted to their immediate aspirations. Adding injury to insult, in the fall their influential midfielder had damaged his shoulder. Some reports suggest a broken collarbone, other a dislocated shoulder. Whatever the case, Beckenbauer had paid a heavy price for the free kick. The cost would have seemed much heavier as, when the players were all calmed and play could resume, the free kick brought no tangible reward. Was that the last chance? Italians hoped it was. Germans feared it was. The experienced head of Seeler had come up short, as it was banged repeated against the Azzurri wall, resulting only in a headache. So too had the predatory instincts of Muller. Not a chance to feed his rapacious hunger for goals had fallen his way. As with the quiet bank clerk enlisted to arms to defend his country, or the seemingly inconsequential youth who throws himself into a river to rescue a drowning child, there’s a time for the unlikely hero and, for West Germany, that time had come. There was barely any time on the clock as, out on the German left, Grabowski prepared to float another cross into the Italian area. As the ball arrowed towards the six yard line, the most unexpected of recipients appeared. Karl-Heinz Schnellinger had plied his trade in Italy’s Serie A since the early sixties, travelling to Milan via AC Mantova and Roma. In almost 300 games for the three clubs he would score a paltry three goals. In 47 games for his country, he would net just once – but this was the time. As the ball reached the blond defender, he opened his body to angle his right foot with sublime skill, and seemingly a striker’s instinct, to place the ball past Albertossi and into the net. 1-1. The latest of last gasp equalisers. The Germans were understandably elated. On television, commentator Ernst Huberty exclaimed, “Schnellinger, ausgerechnet! Schnellinger!” (Schnellinger, of all people! Schnellinger!). After the game, there was talk that some Italian players commented to the scorer that it would be wise for him not to return to Italy, for his own safety. It was a theme apparently repeated some 28 years later, when Ahn Jung-hwan, who also played for an Italian club, scored for South Korea to eliminate Italy in the 2002 World Cup. If such threats were made, they didn’t seem to bother the teak tough defender. His years in Italian football would have hardened him to such scurrilous comments. In the final analysis, the identity of the scorer mattered little and as much as new found hope rose in the West German team, it must have been as a dart into the heart of the Azzurri. So near, but now so far. Soon after the restart, the referee blew to end the game. Schnellinger had not only reached into the fire to pull out a result. He had also set in train a 30 minute period of extra time that would define what had to that time been an absorbing, but largely frustrating game, as the Azteca’s “Pertido deal Siglo” was to justify its title. Much as Italy felt deflated, the Germans were also exhausted by their efforts to force open the bolt of Italy’s Catenaccio defence. Like two heavyweight boxers entering the last round of a title fight however, energies were summoned for one last effort. Both teams would come out slugging, looking for the knockout blow. More than a few haymakers would find their target. It was time for a Big Dipper ride of emotions. Just four minutes had passed into the first period of extra time when the first blow was landed. A German corner from the right was flighted in and Uwe Seeler, as he had seemingly done a thousand times in his career, rose at the far post to head the ball across goal. Substitute Poletti calmly chested the ball down and back towards Albertossi. ‘He who hesitates is lost’ as the saying goes, and that certainly applied to the Italian goalkeeper. Noticing the merest hint of a chance, as Albertossi all-too-briefly hesitated, Gerd Muller’s predatory instincts blazed. He pounced, and darting between goalkeeper and defender, he flicked the ball wide of Albertossi towards goal. The angle was so sharp however, and the contact from Muller’s boot was slight. Agonisingly, slowly, oh so slowly, it trickled towards the line as Albertossi and Pelotti scrambled to redeem their errors. Too late. The ball rolled over the line and West Germany, who had looked so lost just a few minutes of playing time earlier were in front. Surely now, not only with the lead, but also having the Big Mo of momentum with them, West Germany were in charge of the game, and the Italians were on the ropes looking dazed, battered and bruised. As mentioned though, this Italian team had more than a bit of the street fighter mentality and they were still to have a say. If Schnellinger had been the Germans’ unlikely hero, dragging his nation back into the game, Italy were to respond in kind with Tarcisio Burgnich. The defender had played for Udinese, Juventus and Palermo before finding his true home in Lombardy with Internazionale, where a stay of a dozen years would see him play over 350 games for the Nerazzurri. A four minute period was all that the Germans had to savour their lead before Burgnich struck. Veteran of the final four years earlier, Sigi Held had now entered the fray from the substitutes’ bench to replace centre back Bernd Patzke. For all his estimable qualities and experience however, Held was no centre back. A Rivera free kick was floated into the German penalty area. Held rose to head clear, but his mistimed contact only dropped the ball down towards Burgnich. The Inter defender pounced to fire home, and reignite the Italians’ hopes. For a game that had its initial two goals separated by over eighty minutes, it had now produced two more in the space of 320 seconds, both netted by the most unlikeliest of scorers. The next goal scorer was to be far more predictable. Both teams had landed big punches, and whilst both had equally staggered under the blows, strength sapped by the heat, exertions and emotion, both were still on their feet and swinging. A mere eight minutes after the referee had blown to begin extra time, a third goal was scored. Out on the left flank, Domenghini crossed into the middle. On the edge of the area, Luigi Riva, his Cagliari team mate controlled the ball expertly with the outside of his left foot, deceived the eager Schulz and thundered – appropriately enough – a shot past Maier. Should you ever have an opportunity to listen to that moment’s commentary by Nando Martellini, don’t miss out. His rising scream, filled by passion, of “Riva, Riva, Riiiivvvaaaa!” portrays the relief and exultation in its stringing out of a four-letter name into something worthy of a Latin schoolmaster’s description of an irregular verb form. Much as the Germans had gone from 1-0 down to 2-1 up in a the space of five minutes, the Italians had now delivered their own riposte climbing back up off the floor of being 1-2 down to 3-2 up in only four. A game that had for so long appeared fated to end as a run-of-the-mill 1-0 victory, paused briefly at the halfway mark of extra-time, to gather breath. It had now acquired the personality of a basketball game with teams alternating turns to attack – and score. Half time came, bringing a brief but blessed relief. Before the final tumultuous episode of the game’s denouement was launched, the pitch resembled some kind of battlefield with bodies lying on the ground, exhausted. Every inch the wounded soldier, Beckenbauer now had his arm in a sling, and would surely have been substituted were in not for the fact that Schoen had already used up his full allocation of replacements. It seemed an unavoidable conclusion that with fatigue gripping minds as well as aching limbs, the game would be settled by a mistake rather than any flash of brilliance. But no, this game was not yet sated on its overabundance of drama. As the teams lined up to begin the second period of extra time, the players resembled a collection of reluctant combatants, thrust once more into the firing line, with little left to give, but too tired to dispute the command. Walking, rather than running, was the mode as hearts and souls battled with lactic acid for control of legs and arms. Five minutes in, West Germany had a corner out on the right flank. Taken short, by Jurgen Grabowki to Libuda, it was then crossed to the far post where Uwe Seeler, reprising his party piece from a few minutes earlier, nodded the ball back into the goalmouth. Reading his team-mates intentions with a predator’s instinct undimmed by fatigue, Muller drove forward to throw himself at a jagged angle to head it past Albertossi. Rivera, guarding the post appeared caught in two minds as the ball passed him. Too high to block with a leg, too low to head, it sneaked past and into the net. The German limbs may have been weary, but the heart and desire was still there. Der Bomber’s diagonal jump had squared things up again. The game had now almost transformed itself from a contest of footballing ability to one where the sheer will to win – or refusal to contemplate defeat, perhaps – was becoming the dominant factor. Each goal in extra-time, and even to some extents, Schnellinger’s in the 90th minute had become a statement of intent. An assertion of spirit, and although each goal seemed to have come from the last scrapings of an already heavily overdrawn bank of energy reserves, each time there was a knockdown, the other guy still kept dragging himself to his feet to swing again. Muller’s goal was just the latest – surely the last – expression of such devotion to the cause. The ball was now back in Italy’s court, but as they rolled it forward from the centre spot to plunge the bucket into the well once more, amazingly it still didn’t come up empty. Riva kicked off and tapped the ball to Sisti Angelo. He rolled it to Rivera, who summoned the strength for a jog forward, jinking one way and then the other in front of a couple of Germans, before offloading to his left and returning the ball to Angelo. Looking forwards, but finding no targets to play the ball to, the midfielder shuffled it wider to Facchetti. Although a full back, Facchetti was an elegant player and arced a ball forward to match up with the run of club colleague Boninsegna. Turning away from a tired Schulz, the striker drove into the penalty area. Schulz threw in a despairing tackle, but too late. Boninsegna had time to look up and cut the ball back to Rivera striding forwards from midfield. Opting for accuracy, the Milan midfielder side-footed a low shot past Maier and the lead had been regained a mere 20 seconds after it was lost. Paraphrasing the old Spartan exaltation of coming back with their scudo, or on it, the Azzurri had found the killer blow. Maier threw himself to the ground as Rivera was swamped by his team-mates. Now, surely now. West Germany strove to fight back, but this time there would be no response, their well was as dry as their gaping mouths. Had Valcareggi’s ‘Staffeta’ prevailed? Rivera’s goals in extra time certainly suggested that it may have done. Only having played part of the match, when the crucial end game was dawning he had reserves of energy as others wilted. Perhaps it’s not insignificant that it was the Milan midfielder driving forwards to score the final goal. If the manager thought so, he would preserve with it in the final, when Rivera and Mazzola had only shared the Azteca pitch for a brief six minutes against Brazil. The remaining time ebbed away almost as a mercy and, as the final whistle sounded, it brought to an end probably the most sadistically enthralling thirty minutes of World Cup football. Two teams had had stood toe-to-toe and slugged away at each other. Neither would bend the knee. Neither would accept defeat. It had been brutal in its exertion, but also an exhibition of how the human spirit deployed in the sporting arena could draw heroics above and beyond the call of aspiration and national pride. For West Germany, it was a defeat so hard to take. After the controversy of four years earlier, to come up short again must have cut to the soul. Given the extra-time victory over England, whereas Italy’s passage to the semi-final was less exhausting, the toll on German bodies was just too high. Refusing to take a negative tone however, Seeler was to contend that, “If we had to play in the final against Brazil after our extra-time games against England and Italy, we would lose by five. This way, we get to go home as the happy heroes in defeat.” It’s a positive summation, but one that surely hides a lot of pain. At the next World Cup, Seeler’s time would have passed. For Der Bomber, the hurt was not only deep but long lasting. “No one has forgotten that match,” Muller reflected. “It still drives me crazy thinking about it and I haven’t recovered from it to this day.” Muller, however, would have his day in the sun. In a further four years, a team then shorn not only of Seeler, but also the likes of Overath, Schnellinger and Held, but still with Gerd Muller, Maier, Beckenbauer and Vogts in their ranks would at last accede to the summit of world football by dousing the bright orange flame of Johann Cruyff’s ‘Oranje’ in Munich. Muller would notch the winning goal. Italy progressed to the final to take on Pele and the Samba Boys of Brazil in another epic game. Each had previously won the Jules Rimet trophy twice, so whoever prevailed would claim it as their own. Perhaps suffering a similar fate to the West Germans however, Italy too arrived for a showdown with the previous game’s exertions still weighing heavy on their limbs and minds. A first final since 1938 for the Azzurri slipped away as they lost 4-1. For Valcareggi however the tournament had been a vindication not only of his managerial ability, but also of the Azzuri’s right to consider themselves among the world’s elite football nations. By the time Valcareggi left his post in 1974, his team would have suffered only six defeats in his reign covering eight years. It was probably little compensation to either team, but the match they served up on that hot Mexican day remains one of the most compelling contests in World Cup history. Some may argue that the thirty minutes of heart-stopping, heart-breaking drama at the end of the game may not have compensated for what would otherwise have been reasonably unremarkable fare. Others would surely demur from such a view. Perhaps therefore it’s wise to let the final word on the game’s place in the pantheon of outstanding contests lie with a voice of one who has seen so many of history’s greatest ever talents and the highest calibre of games. If the Azteca itself had deemed to describe it as “Pertido deal Siglo” it may just sway the argument. The carping critics take the view that it wasn’t a classic but it was just two defences unravelling in the heat. That may be true but it was one of the all-time great World Cup encounters. The German goals are three of my favourite goals. Schnellinger, flying with his legs splayed out and scoring with his right foot. And he was the left-back! Then Muller, like a shark sniffing blood, sneaking in behind the defender to squeeze the ball over line. Also the Muller header when he threw himself forward like a performing seal to push it over the line. Glad you enjoyed the article. It’s z game that has caused much debate, but what a last thirty minutes.